ePublishing Knowledge BaseePublishing Knowledge BaseePublishing Knowledge Base Common QuestionsWhy is a deleted article / event / product still showing up in my site's search results? Your site's search results are driven by SOLR, our search engine. SOLR is updated when content is added or changed. The actions below tell SOLR to remove the content from the search index, so that it will no longer be shown in your site's search results. If you just *delete* the article, SOLR won't be notified until the next time the site is re-indexed. We re-index the site nightly. Important: If you've recently removed an article that has been on your website for several days or longer, you may find it still showing up in search results. Send in a Medium level support ticket to ask us to reindex your site. 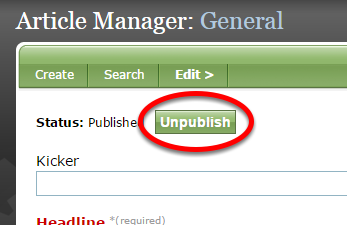 Option 1: Unpublish the content using the relevant tool. 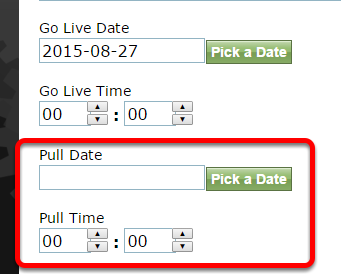 Option 2: Update the pull date of articles, blog posts and directory listings to a past date. Option 3: De-select the Indexable checkbox. This will work for most content. 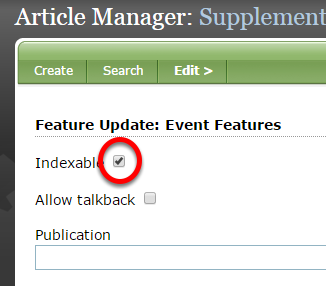 Depending on the tool manager you are in, the Indexable checkbox is either on the first page of the tool or under Supplemental. Prev: What do I do if my website is loading slowly or isn't loading at all? Next: Why can't I add a file to the Media Manager? I've been able to in the past.